What measures can we take to protect from flu (H5N1)? H5N1 is a flu infection, the standard measures to protect yourself are to get vaccinated every year, disinfect your hands often and strengthen your immune system. Is there a product that will give guaranteed protection from the flu (H5N1)? There is no product that can stop a flu virus except for vaccination that is using the specific virus. How can strengthening the immune system offer protection from the flu (H5N1)? Those with weak immune system such as children, the elderly and (more) are more susceptible to viral infection. By strengthening the immune system, it reduces the impact of the infection (eg complications and subsequently risk of fatality). Is there a product that is proven to strengthen the immune system? Esberitox®N a unique combination of plant extracts has been used by doctors in Germay for over 50 yrs to strengthen the immune system. There is so many products that claim to strengthen the immune system, what is the difference between Esberitox®N and these products? Esberitox®N is unique because is it has been prescribed over a long period of time by doctors. Its immune strengthening effect is also proven via more than 20 clinical trials. How to take Esberitox®N for protection? If you are travelling, take Esberitox®N 2 to 3 days before travel, throughout the trip and 3 days after. Is Esberitox®N used for flu (H5N1) only? 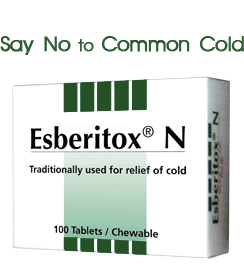 No, Esberitox®N has been used to strengthen the immune system for children and adult with weak immune system. These people tends to get cold (Running nose, sore throat and cough) easily. Esberitox®N is used for both prevention and treatment. If you’ve already have symptom of flu, can Esberitox®N still benefit me? If you have symptoms, see your doctor immediately. However, Esberitox®N can be used to strengthen your immune system even if you have a flu as it helps to speed up your recovery.